Over 400 Hugs Given During Cosmopolitan's Hug A Hunk Event! 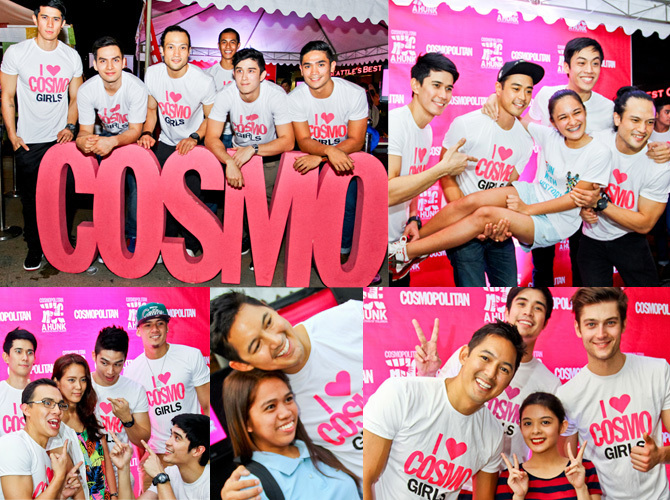 Check out photos from Cosmo's Hug a Hunk fundraiser for the victims of typhoon Yolanda! Cosmopolitan Philippines held its first ever Hug A Hunk charity event on November 30, 2013 from 4p.m. to 7:30p.m. at Bonifacio Global City's Activity Center. 100 percent of proceeds will support Bulig Bisaya's ("Help Visayas") relief and rehabilitation efforts for victims of Typhoon Yolanda. The hugathon started at 4p.m., with Cosmo centerfold Vince Ferraren kicking off the event. More hunks arrived within the hour: Jon Hall, Marc Nelson, Miguel Lasala, Luk Conde, Jules Aquino, Vic Sy, and Donovan Prince. Each 20-second hug cost P100, with a complimentary photo as a souvenir. By 6p.m., the Hug a Hunk tent was overflowing with Cosmo's hottest guys. Also in attendance were: Brent Javier, June Macasaet, Marco Yulo, Inigo Dulay, Andre Paras, Vaughn Canta, Daniel Velasco, Van Leano, Jake Letts, Harry Morris, and Simon Atkins. Cosmo would like to THANK YOU, for making the Hug a Hunk fundraiser possible, and for proving that giving back has never been hotter! Check out the lucky Cosmo girls who got hugs and gave back!